Cardinal Double 12 Color Dot Mexican Train Dominoes in Tin — This set of 91 dominoes features engraved dots, and each number has a distinct color, making them easy to tell apart. Includes a hub, four domino trains, and complete instructions. Domino Express Racing — This domino racing pack has everything you need to turn knocking over dominos into an incredible event. Includes 100 dominoes and 50 specially crafted speed dominos that fall at lightning speed. Puremco Spinner – The Game of Wild Dominoes — Enjoy a colorful spin on dominoes! Game play is similar to regular color dominoes, but some easy-to-learn rules and unique Spinner dominoes add a fun twist to this version of the game! Cardinal Double Fifteen Color Dot Dominoes in a Collectors Tin — This set includes 136 jumbo sized color dot dominoes, and everything you need to play Mexican Train and many other domino games, all housed in a sturdy collectible tin. Front Porch Classics Mexican Train Dominoes — This deluxe edition features the finest materials including an elegant wooden box, a solid wood train station, cast metal trains and 91 tournament style double twelve color dot dominoes. Melissa & Doug Classic Wooden Dominoes — This Dominoes game set is made of solid wood, painted by hand in handsome colors, and features a clever storage system that hold all the pieces securely. This beautiful set also makes a fantastic table top or wall decoration while not in play. Fundex Domino Trays — Features four solid wood racks that can be used to hold dominoes or playing cards. Much easier than holding them in your hand, and more secure than balancing them on the table! Double Six Professional Dominoes with Brass Spinner in Wooden Case — This premium set of 28 dominoes is composed of quality plastic and will provide you with hours of fun, and will add a new dimension to your gaming. Puremco Double Twelve Numerical Dominoes Set — Number Dominoes ease the playing of domino games by using large, color-coded, embossed numbers to replace the traditional dots. They are easier to count and tally scores at the end of each round. The large numbers also make for easier identification for those with weaker eyesight. Mexican Train Domino Game in an Aluminum Case — Features 136 jumbo sized color dot dominoes and everything you’ll need to play Mexican Train, all in an aluminum carrying case that is rugged and easy to store or transport. Enjoy one of these great products, or Shop Amazon’s Cyber Monday Week ! Disclosure: Domino-Games.com is an Amazon affiliate. When you shop at Amazon, by clicking through one of the links listed here, and make a purchase, we’ll earn a small commission. If you do so, thanks! Amazon sales help to keep this valuable web site online, and encourages fresh content and frequent updates! How Well Does Dominoes Rate as a Strategy Game? The game features bones (tiles) with a number of pips on them. Players match them up trying to empty their hands by matching one of the numbers with one of the free numbers on the table. Dominoes are also noted for being able to stand on end in long rows so that when one is knocked over they all fall in a row. A popular pasttime is lining up hundreds or thousands of dominoes to make designs when they fall. Some domino games are purely mechanical, other can be quite strategic. Which dominoes game is the poster referring to? Doesn’t say. The number one, most strategic game in the world, according to this list? Poker. What do you think? How should Dominoes rate in the pantheon of strategic games? The first U.S. Open Domino Championship is being held in Mesquite, Nevada (1 hour north of Las Vegas) on December 6, 2008. The tournament is organized by the USITA, an organization formed to promote fee-based internet tournaments of all types. USITA has an agreement with Game Colony to host all tournaments. You must be a member of Game Colony (membership is free) to join USITA. Being a member of USITA will not guarantee you entry into tournaments (entry into tournaments will be on a first-come basis) but you must be a member of USITA to participate in USITA tournaments hosted by Game Colony. In addition to the U.S. Open Domino Championship, the USITA hosts 12 online tournaments every month, with low entry fees and great cash prizes. 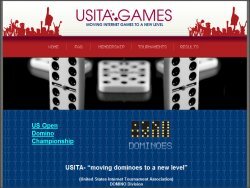 Learn more about the USITA and the U.S. Open Domino Championship. Bendomino: Dominoes With a Twist! Bendomino offers a new twist on the classic game of dominoes – literally! 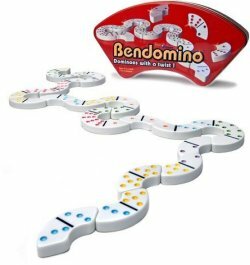 Bendominoes play just like regular dominoes but their innovative, curved design gives players more control over the game. In this twisting game, a new bendomino in play needs to match by number to either end of the chain, but also has to fit! This adds an intriguing new element of strategy to a familiar game. Each game of Bendominoes is unique, with a new pattern being created each time you play, with pieces twirling around the table. Bendomino was created by Thierry Denoual and is published by Blue Orange Games. The Bendomino set includes 28 curved dominoes (a double-six set), and is intended for 2 to 4 players. Most standard domino games can be adapted for Bendominoes, once you account for the unusual shape of the tiles. A Junior version of Bendomino is also available, which uses pictures instead of pips. Comments Off on Bendomino: Dominoes With a Twist! Online video site VideoJug has produced an excellent introduction to the game of draw dominoes. The video includes everything from basic information about the dominoes themselves, to rules and variations for playing Draw Dominoes. Even if you’ve never played the game before, this video explains the rules in a simple and straightforward manner that will have you up and going in no time. If you’re absolutely new to the game, you should probably be aware that the rules provided in the video are a bit non-standard, particularly in terms of their use of blanks as wildcards. Refer to our Draw Domino Rules for the rules you’re likely to find in most references and Draw Domino games. Read more about the How To Play Dominoes Video and VideoJug. Zigiz Dominos is an interesting new online game. The game is played solitaire-style, and it’s actually more a puzzle than a traditional dominoes game. Your goal is to play all of the stones onto the board, earning bonuses based on your speed and skill. The flash-based gaming environment is quite rich, with great graphics and sound. The game is also easy to use, with a simple drag-and-drop interface. Zigiz is a European skill gaming company, and offers a large number of great games, including card games, puzzle games, and arcade games, all of which can be played for free as long as you like, or played for a chance to win great cash prizes. 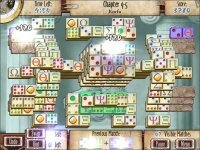 In addition to the Dominos game, Zigiz also offers Klondike Solitaire, Pyramid Solitaire, Spider Solitaire, Mahjong Solitaire, a Yahtzee-style game, a Bejeweled-style game, and many more, all of which are very nicely done. In an article in the Sacremento Bee (Domino Effect), staff writer Alison apRoberts writes about a new board game based on dominoes. ZingaMino was created by an engineer named Dahmane Dahmani and his 11 year old son Yanni. Together, they formed a company to take their form of family fun to market. The game is the product of more than 2 ½ years of quality father-son creative brainstorming and considerable investment in professional design and prototyping. They introduced their game at the American International Toy Fair in New York City in February. “Today, it’s possible for game lovers everywhere – including children — to participate in the market,” Dahmani says. 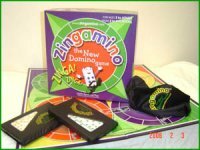 ZingaMino is a colorful twist on classic dominoes where you literally “play outside-of-the-box.” Taken from Swahili, the word “Zinga” means to turn in circles, and that’s just what you’ll do. Players race to fill four game circles that must connect sequentially. The luck of the draw can bring a Zinga!™ for extra points or even the win. What goes around comes around in a beautiful balance of strategy and chance. The game is available for sale from the ZingaMino web site for $29.95. This is not, strictly-speaking, a domino game, which is why I’m not going to list it on this site’s Dominoes Software section. But Mah-Jomino is certainly a game that may be of interest to domino fans, particularly those who also enjoy the game of Mah Jong Solitaire. Mah-Jomino, as its name implies, is a mixture of dominoes and mah jong. Basically, it’s mah jong solitaire played with domino-like tiles rather than classic mah jong tiles. The object of the game is remove matching pairs of tiles from the layout, until the entire board is cleared. What makes this game different than all the other mah jong solitaire games is not just the use of domino tiles, but the fact that a domino tile has two ends. This small change helps to make Mah-Jomino a truly unique game, and a rather interesting and enjoyable one as well. It’s worth checking out. Gamezebo offers a list of Tips & Tricks for the game.